Today is really the first day I have time to catch up with personal stuff since I arrived in Bangalore over a week ago. 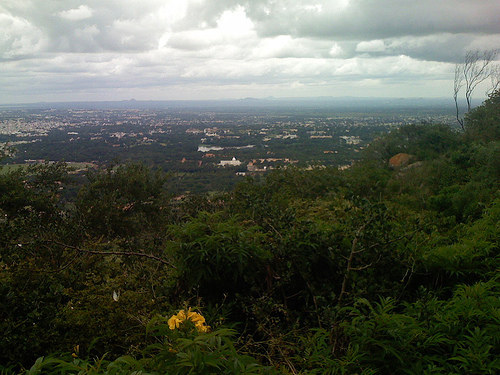 Last weekend four of us decided to arrange a tour of Bangalore ourselves after the semi-official one was canceled due to not everyone had arrived yet. We rented a mini-van for a whole day and visited the local zoo first. The zoo is about just over an hour drive away from our hotel and we got to take in a lot of local scenery as we drove there. We went on a safari bus tour through the zoo and got to see closeup bears, deers, lions, and tigers. 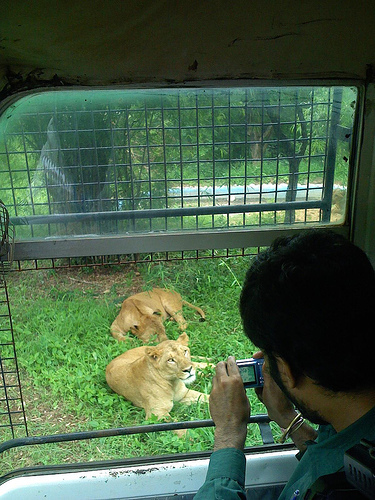 The bus driver was a bit mad, in my opinion, since at one point he drove the bus to within 6 foot of three lioness. He then proceeded to bang on the door to get their attention so we could take better photos! As if that was not enough, he also opened and slammed shut the door to get the attention of the lioness furthest away from us! 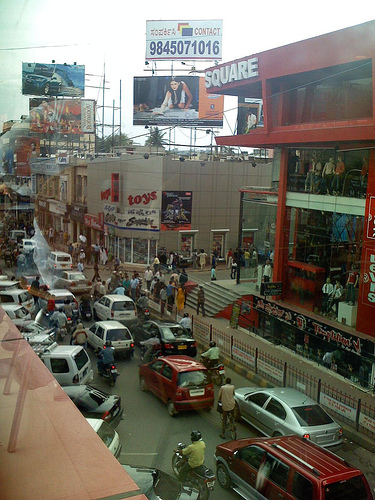 By that time we were all very hungry and we told the driver to take us to the M G Road which is the main shopping road in Bangalore. I'm ashame to say but we had KFC for lunch as one of us (not me) had upset stomach and wanted to have American food instead of Indian. While we ate our chicken sandwich, we spotted some very funny signs in the road side. One of them was, "If you cross the road here, you will be surrounded by blood pools." Another one goes, "Cross at pedestrian crossing, give way to vehicle." I managed to score a good deal on some jewelery for Leah but didn't manage to get any dresses for her since I wasn't sure which style she wants. 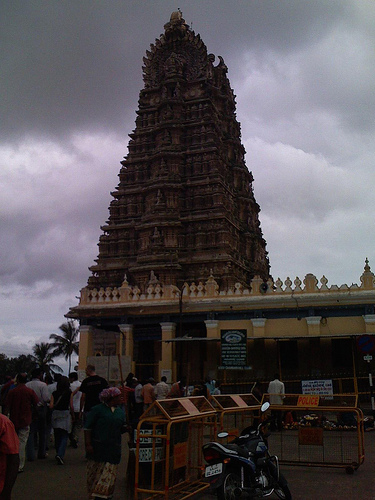 Yesterday over 40 of us went to an organized tour of Mysore, which is about 3 hours drive away from Bangalore. We set off pretty early in the morning (around 7:30AM) and drove to a place to have breakfast. Even after spending a week in India, I still haven't gotten over eating more or less the same food for breakfast, lunch, and dinner. But as Indian food is the only option, we all ate it up quickly. We had lunch at a 5 stars hotel and they had lots of Indian deserts which I consumed with great enthusiasm. After a week of not really having any sweet food, it was haven! After lunch we were entertained by a local magican outside the hotel. Despite he performed all the usual tricks (balls in cups, etc. ), he was so slick that all of us were impressed. 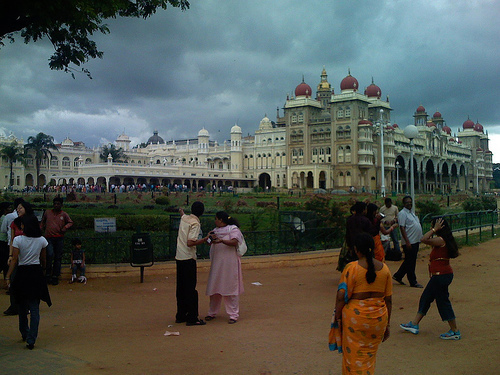 The last destination of the tour was the palace in Mysore. The palace is huge and again we were forced to take our shoes off to go inside. This time I joined the group and after walking bare feet for over an hour, I had never appreciate footwear as much as I did when I put my shoes back on! By then it was pretty late (around 5:30PM) and there wasn't really time for the shopping trip, which originally planned for 2 hours in downtown Mysore. We ended up visiting a Government approved shop (whatever that means) and I managed to find couple of Indian dresses for Leah for relatively inexpensive price. 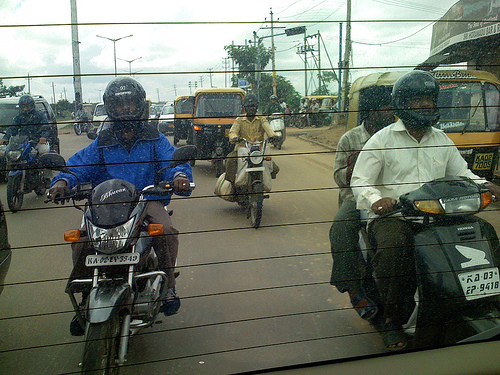 The trip on the way back was a bit scary, even for me the crazy driver. The bus driver wanted to get back to Bangalore before 10PM so he drove pretty fast all the way, sometimes as fast as 60+ mph which was scary in an Indian bus on Indian road! Thankfully, we got back in one piece but there were couple of times where we almost hit some truck or cut off another car.